This update of Kautilya introduces reboot persistence for HTTP Backdoor, DNS TXT Backdoor and Keylogger. The payloads for Windows have been rearranged in five categories making the menu clearer. Another major improvement has been the addition of DNS TXT exfiltration and HTTP POST exfiltration to your own website. That means, your need not leave credentials of your pastebin/gmail on target. Note that in case of gmail, you can use application specific passwords. Both of these exfiltration methods were suggested by users. WMI permanent event consumer is included in the code for persistence, But actually, it is not being used by any payload! Why? Because, it requires administrative privileges and both the backdoors run with non-admin privileges. In the case of Keylogger too, only Run registry key is used. Besides the above reason, there is one more catch, the WMI permanenet event consumer we are using, executes the payload with SYSTEM privileges on system reboot while the Keylogger logs keys in the context of the user it runs. This makes it necesarry to run the Keylogger with the privileges of current user and not SYSTEM. So persistence using WMI is included for future use. Do leave a comment if you think additional payloads needs persistence. It is trivial to do but needs little code changes in .ino or .pde file of that payload. A powershell script Remove-Persistence.ps1 has been added in the extras directory which could be used to remove persistence added by various payloads in Kautilya. The exfiltration method could also be used for bigger data, it simply divides the data and sends multiple queries. I will soon write a separate blog post to cover that. Now, this data is compressed and encoded using the method found here. To decode it, use Decode.ps1 which has been added to the extras directory. Great! We were able to exfiltrate data using only DNS TXT queries. A VM in my lab is running a simple code, which I got from stackoverflow. Now, lets try this with the WLAN Keys Dump payload. Those who take interest in source code of Kautilya may notice that all the payloads have been made more modular. It means, if you chose not to do exfiltration the payload would be much smaller now, unlike earlier. Same goes for persistemce. This makes it easier to use payloads of Kautilya on various devices. - Bug fixes and improvements in Time Based Exec. It now supports exfiltration and could be stopped remotely. - Less lines of code for HTTP Backdoor and Download Execute PS. - HTTP Backdoor, Download Execute PS, Hashdump and Exfiltrate and Dump LSA Secrets now execute the downloaded script in memory. - Shortened parameters passed to powershell.exe when the scripts are called. Thus, saving the time in "typing" by HID. 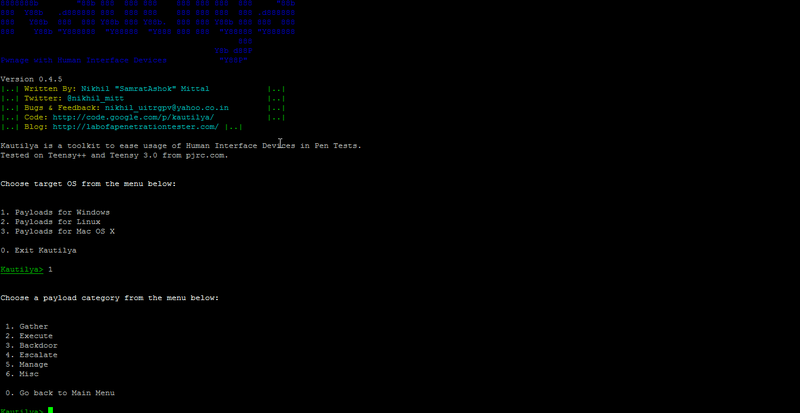 - Added two new exfiltration options, POST requests and DNS TXT records. - Username and password for exfiltration would be asked only if you select gmail or pastebin. - Tinypaste as an option for exfiltration has been removed. - Payloads have been made more modular which results in smaller size. - Reboot Persistence has been added to HTTP Backdoor and DNS TXT Backdoor. - Bug fix in Dump LSA Secrets payload. - Added ./extras/Decode.ps1. Use this to decode data exfiltrated by HTTP Backdoor and DNS TXT Backdoor. - Added ./extras/Remove-Persistence.ps1. Use this to remove persistence by Keylogger, HTTP Backdoor and DNS TXT Backdoor. 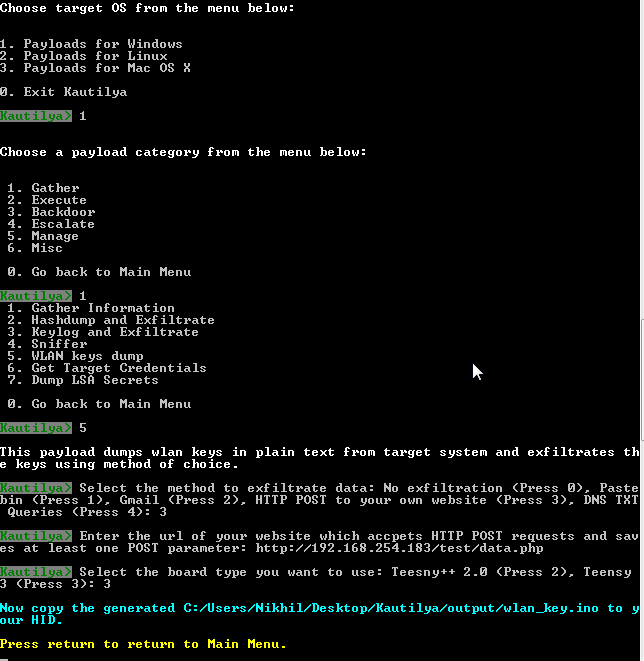 - Kautilya could be run on Windows if win32console gem is installed. As always, I welcome feedback, bugs and feature requests. I have noticed that in Version 0.5.5 the decode.ps1 is no longer in the extras directory. 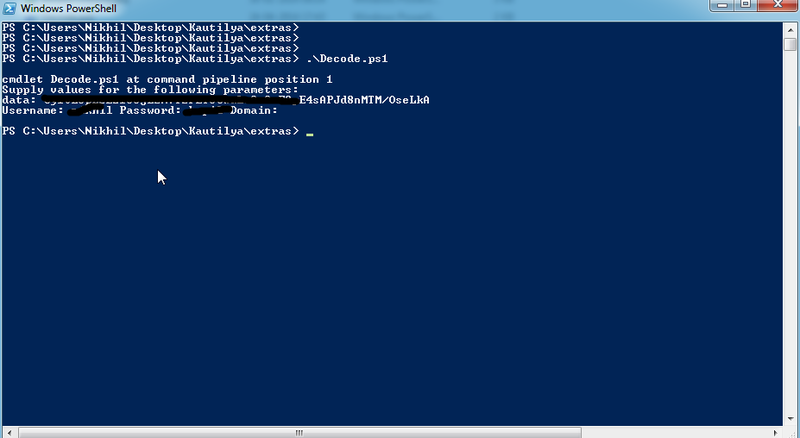 What other Powershell Script has replaced this to be able to Decode the DNSTXT record. Invoke-Decode.ps1 is the new one. Sorry for the confusion. Thanks for getting back to me so quick. I was able to replicate everything in a lab but i cannot get it to decode the TXT records appropriately. I have screenshots and a PCAP i can share if you are willing to look at it with me. Could you share a gist/paste of the encoded data and screenshot. If its something you can't share publicly, drop me an email. I am a hacker, information security researcher and enthusiast. On this blog, I write about my projects, experiments and presentations.